All prices are in Canadian dollars. We use the total number purchased (ELM406P + ELM406SM) for the calculation. 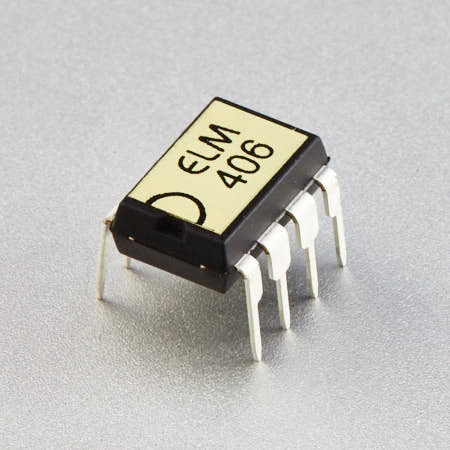 The ELM406 is an 8 pin integrated circuit that is used to convert the output from a rotary encoder into three signals (chip select, clock and up/down) that can be used to control various devices. The low power CMOS technology used ensures that only a very small current is required over the entire 2.0 to 5.5 volt operating range. There is no need for external filtering or debounce circuits with the ELM406, as this is all performed within the integrated circuit. After debouncing the encoder signals, the ELM406 determines the direction of shaft rotation, and then generates the appropriate outputs. A write sequence can also be generated if the Write Enable input is at a high level when the outputs are generated. The ELM406 provides 2x decoding of a rotary encoder signal. If your application requires 4x decoding, please see the ELM407 (it is identical to the ELM406 in every respect, except that it provides 4x decoding).